“They’ve estimated between the savings on electricity and the maintenance costs, about $12,000 a year,” Sporhawk said. Beckley says the cost savings will help him add rides to the adventure park. But seeing water return to formations in the cave that were drying out is priceless. 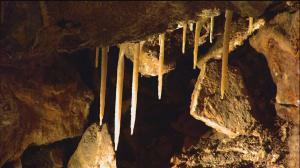 The Glenwood Caverns started as a tourist destination in the late 1800s, but was shut down before the Great Depression. It reopened in 1999. The current owners hope to expand to even more areas of the cave next year.